The football recruiting trail is littered with the bones of prospects who never reached their potential, but you always like to go back and look at the ones that seemingly rose from obscurity to make it big. 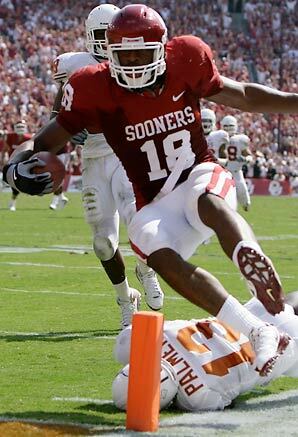 Former Sooner and current Cincinnati Bengals tight end Jermaine Gresham is one of those. Blessed with size and speed, Gresham rose from a dirt poor background to become one of the top receivers in the game. But in late 2005, Gresham was just a tall basketball star that was starting to become a major football recruit without much fanfare. It all started with a video, in the days before the Internet had taken over recruiting and it culminated with OU getting a major star. And when I spoke with him, he was not used to all the attention that was starting to come his way. 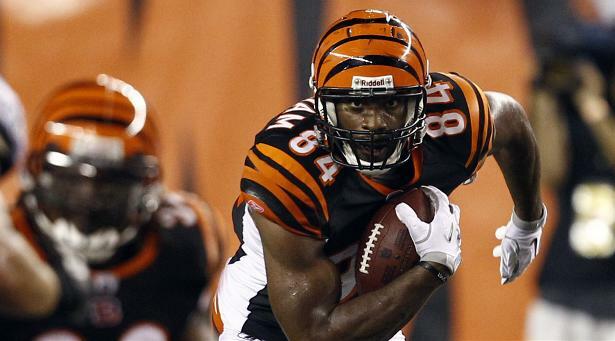 Let’s take a look back at the emergence of Ardmore’s Jermaine Gresham. For a town of just under 24,000 residents, Ardmore has turned out its fair share of major college football prospects. And most of them have been skill position athletes. 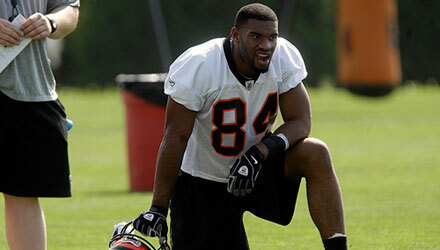 But none have possessed the overall God given talents of the latest recruit on the national radar, Jermaine Gresham. At a shade over 6-6 and currently weighing 232 pounds, Gresham has recruiters ready to beat a path to the Carter County town this fall. In high school, he has played wide receiver and even some defensive back, but college coaches project him as a tight end in the mold of Tony Gonzalez, Jeremy Shockey or Kellen Winslow, Jr. Like Gonzalez, Gresham excels in basketball, having scored 39 points in the opening round of the 5A State Tournament this season. He averaged over 20 points and 10 rebounds a game this year, leading his team to a runner-up finish. Even though he is good enough to play basketball at the D-1 level, Gresham says he plans to play football. Interestingly enough, Gresham has caught the attention of every major college football program in the country without going through one of the standard rituals that put most recruits on the map. The soft-spoken star has never attended any school’s summer camp and doesn’t plan to do it this summer, either. Instead he will work at the high school and re-take several classes to try and improve his overall grade point, hoping to reduce the score he needs on the ACT test. He took the college entrance exam for the first time in April. Rivals.com, one of many recruiting sites that engulf the Internet, fueled his nationwide discovery. They posted video of Gresham in action and later traveled to Ardmore to see him in person, and they have now ranked him in their top 100 prospects for 2006. They currently list 10 schools in the running for his services, including Oklahoma. 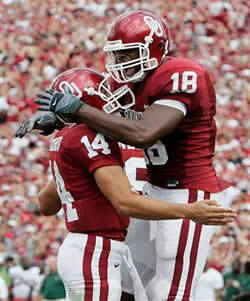 Traditionally, OU has had a tough time with the nationally touted recruits from Ardmore. In the late 80s, Rafael Denson was a highly sought running back who chose Oklahoma State over Oklahoma, and in the 90s, wide receiver Taj Johnson left the Sooner State to sign with Miami, later transferring to San Diego State. The Sooners may have their work cut out for with Gresham, too, who says he is “wide open” in the recruiting process and will probably not commit to any school in the fall. He did ask his coach to take him to an OU spring scrimmage, possibly a good sign for the Sooners. Gresham claims to have no allegiances to any team, saying he’s just a fan of the game. Hundreds of letters have been pouring in to his mailbox, and his high school coach, Mike Loyd, says a number of scholarship offers have already arrived. OU and OSU, along with LSU, Texas, Nebraska, Missouri and Iowa State have made that step, while schools like Notre Dame, Miami, Ohio State and Michigan are also hot on the trail. One school that Gresham was looking forward to hearing from was National Champion USC. “It’s kind of surprised me that I haven’t heard anything from them. Everybody else has stepped in”, said Gresham. Several days later, the first correspondence from the Trojans arrived. This is heady stuff for a 16-year old whose coach thought he was just a basketball player when he arrived at Tigers’ workouts a few years back. 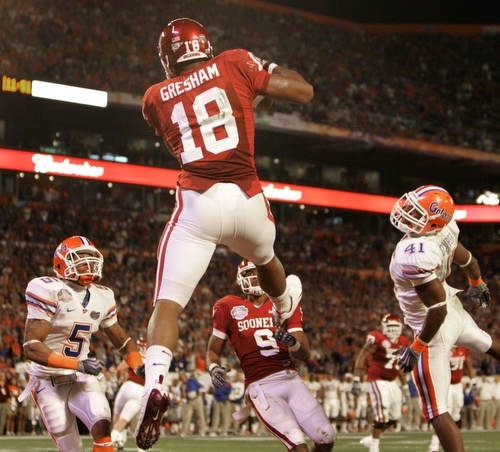 Gresham changed that perception with 27 catches his sophomore year, and 56 more last season. Those who have seen him in person or on tape marvel at his grace and agility. And he has decent speed for his size, running a 4.6 in the 40-yard dash. Gresham is also modest in evaluating his own talents. What is frightening is that Loyd believes Gresham has only scratched the surface of his ultimate ability. Loyd should know a little about what it takes to make it as a big-time college football player. He played quarterback professionally for six seasons and coached junior college powerhouse Northeastern Oklahoma A&M from 1990-1995, leading the Norsemen to the 1991 National Championship. There, he produced a number of receivers who went on to star in the major college ranks and NFL, among them former University of Tulsa star Chris Penn. Loyd says Gresham at this stage is ahead of any receiver he ever coached at NEO. “Number one, he’s a good guy. He works hard, is fun to coach and fun to be around. To make sure that Gresham is prepared for the onslaught of recruiting advances that will intensify as the year develops, Loyd frequently sits down with his star player to map out a strategy for the recruiting process. He also brought in a couple of former OU stars to talk to Gresham about what to expect as schools try to entice him to join their programs. Former Sooner tight end and recent Denver Broncos signee Stephen Alexander, heading into his ninth NFL season, recently traveled to Ardmore to give Gresham an idea of what the process is like and what schools will expect of him at the D-1 level. Alexander also talked to the youngster about getting his academics in order and about what kind of attitude college coaches would be expecting. The Chickasha native was accompanied by another former Sooner teammate, J.R. Conrad, who is now a coach with the Oklahoma City Yard Dawgz of the Arena II football league. All of the attention is apparently having an impact on the young receiver. Gresham has started to become more serious in his workouts and is starting to build his body in a way that will meet college coaches’ expectations for the move to tight end. Loyd says Gresham reminds him of a bigger Ryan Humphrey, the former Tulsa Washington two-sport star who was a top tight end recruit by many colleges but chose instead to play basketball and is now in the NBA. Gresham has always been a marked man on the gridiron, drawing double and sometimes triple coverage. Despite that, his coach plans to get him the football as much as he can this fall, especially on the short routes, where Gresham can use his size and agility to make yards after the catch. On the hitch pattern, Loyd says you can expect Gresham to run over his share of cornerbacks, too. He has averaged over 12 yards per reception on that particular pattern during his career. Opposing teams won’t be the only ones zeroing in on Gresham this fall. The nation’s top programs will be vying for an opportunity to have him make one of his five official visits to their campus, but so far, he isn’t giving any hints as to how his top five list will shake out. He made that visit to USC and to Miami, but eventually settled on OU, where his Mom could see him play. After a slow start his freshman year, he exploded with more than 100 catches and 25 touchdowns in his next two seasons. 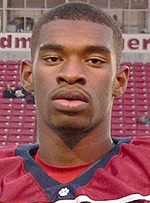 The injury bug, which had continue to follow him to college, prevented him from playing his final season and he elected to turn pro, becoming the 21st overall selection in the 2010 draft. He signed a contract worth $15.85 million dollars, making those hardscrabble days growing up in south central Oklahoma a thing of the past. His pro career has flourished, despite more injuries, as he joined fellow Sooner Keith Jackson and another Hall of Famer, Mike Ditka, as the only tight ends to catch 50 or more passes in their first three NFL seasons. After back-to-back Pro Bowl selections, Gresham saw his workload diminish in 2013 as he split time with rookie Tyler Eifert, but at 6-6 and 261 pounds, he remains one of the most feared targets in the league. 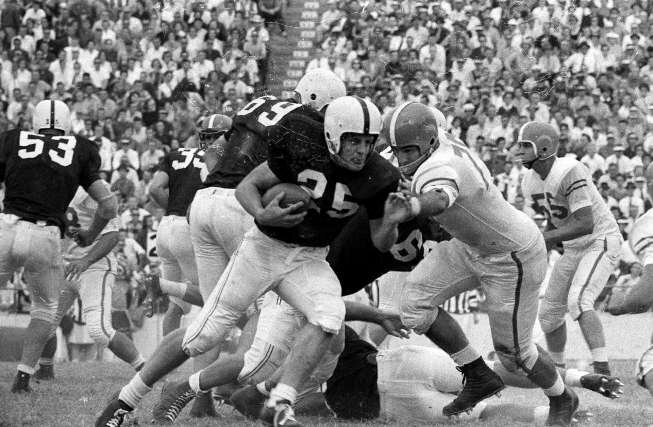 Spend five minutes with Tommy McDonald and you almost expect the 79-year old Sooner legend to buckle his chin strap and jump back onto Owen Field, ready to score another touchdown. 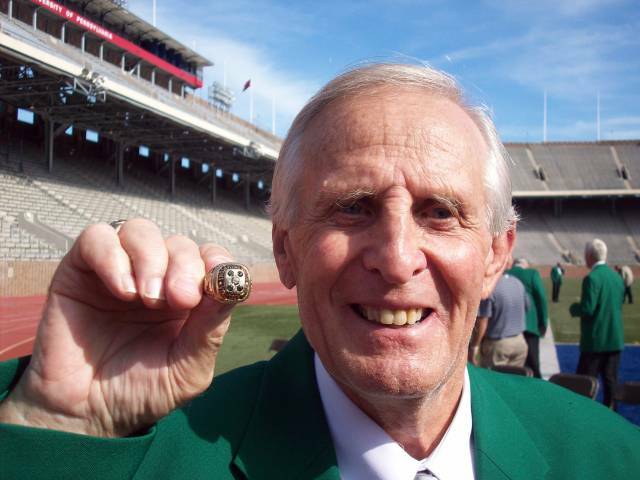 The years have done nothing to diminish McDonald’s enthusiasm about life and about his days with the greatest teams of the Bud Wilkinson era at Oklahoma. McDonald grew up in New Mexico, but says he’s an Oklahoma boy at heart. As a 5’9, 147 lb. halfback growing up in a the tiny town of Roy, NM, McDonald never dreamed of playing in front of thousands of fans. But when his family moved to Albuquerque and McDonald became the focus of Highland High Schools single-wing offense, his fortunes began to change. Where would have McDonald’s life have taken him if he had stayed in Roy? “My little rear end would have been on a tractor planting wheat,” joked McDonald. Instead he wound up being All-State in football, basketball and track, but was still largely ignored by major football schools until Oklahoma basketball coach Bruce Drake spotted him in an all-star game and recommended that Wilkinson give McDonald a look. Meeting Wilkinson was all it took for McDonald to choose the Sooners. McDonald credits Wilkinson’s innovative Split-T offense, a great coaching staff and an abundance of talent for Oklahoma’s magnificent performance during his three varsity years. But the dominance of those Sooner teams created problems for players when it came time for post-season awards. Rarely did starters play more than half the game, as Wilkinson often platooned his first and second teams in alternate quarters. 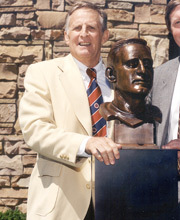 Still, McDonald was able to garner the prestigious Maxwell Award and The Sporting News Player of the Year and finished third in the Heisman following his senior season despite getting only 110 carries during the season. Midway through that 1956, OU had just rolled to a 40-0 win over Notre Dame and had outscored their first five opponents 223-12, recording four shutouts. But in their sixth game at Colorado, in front of a national television audience, the Sooners found themselves trailing the Buffaloes 19-6 at halftime. That’s when the most memorable moment of McDonald’s career took place. Capping his collegiate career by grabbing MVP honors at the North-South All-Star game, Mc Donald caught the eye of the Philadelphia Eagles, who picked him in the third round of the NFL draft. 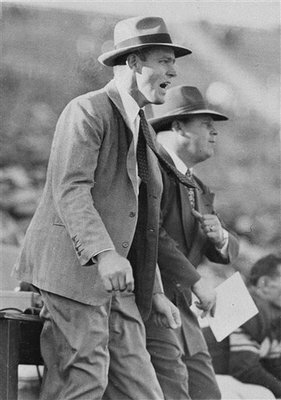 At the time, pro football hadn’t yet taken over the nation’s interest, and McDonald did have his teaching degree from OU to fall back on. Even though the $12,000 the Eagles offered him doesn’t sound like much now, it beat the $2,200 a year he could have earned in the classroom. Early in his rookie year, McDonald was lost in the shuffle at running back and was primarily a kickoff and punt returner. But an injury at wide receiver prompted Eagles coaches to give McDonald a look at wide receiver, and in a game against Washington, he scored two touchdowns. 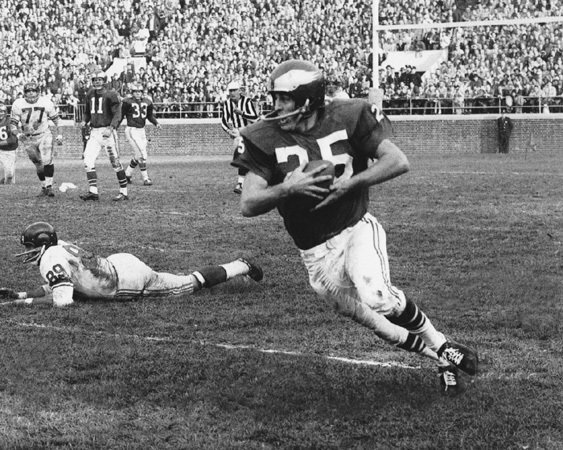 He went on to have a Hall of Fame career, played on the 1960 Philadelphia NFL championship team and spent 12 years in the league with the Eagles, Rams, Falcons, Cowboys and Browns. 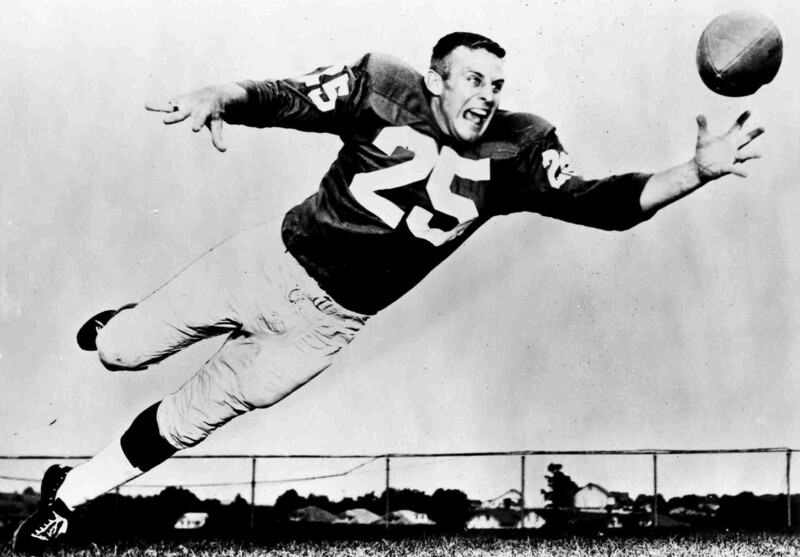 In 1962, he was featured on the cover of Sports Illustrated as having football’s best hands. In 1998, he was elected to the Pro Football Hall of Fame, becoming only the second Sooner player to receive the honor, following Lee Roy Selmon’s induction just a few years earlier. His appearance in Canton was memorable, as he stole the show by chest-bumping fellow inductees, and made an unforgettable speech. “God Almighty, I feel good!” shouted McDonald, football’s smallest but definitely loudest Hall of Famer. He cracked jokes about his wife and tossed his 25-pound bronze bust around like a football. He talked to his father and Ray Nitschke, whose ghosts he claimed were standing on stage with him. McDonald trumped that by pulling a radio out of his briefcase and dancing to disco music on the hallowed steps of the hall, live on national television. Following his pro career, McDonald returned to the Philadelphia area, where his Tommy McDonald Enterprises supplied portraits to Heisman Trophy and Miss America winners, among others.